It is hard to decide on the most amazing plant in the history of manufacturing, but one contender is certainly the Venetian Arsenal, the shipbuilding, munitions-making industrial powerhouse that allowed the tiny city-state of Venice to be a world power for 600 years. Although the site had been used to maintain ships since perhaps the 8th century, it was in 1320 that the Arsenal became Venice's premier shipbuilding facility. This was a time when most of Europe had no manufacturing more efficient than the guild system, the slow and tradition-bound way craftsmen had of passing on skills to their sons or apprentices while monopolizing production and sale of craft pieces in a given region. Even the craft system was not the rule for Europe - the bulk of goods in those times were still made, not by paid specialists, but by the people who would be using them. The Arsenal was something different, a harbinger of future times. It often happens that we find what seems to us in hindsight like revolutionary innovation in organization or technology largely ignored by its contemporaries, rather than instantly copied like we in the modern world have come to expect. The most famous example is the failure of China to apply gunpowder technology to weapons. The Ancient Greek discovery of the steam engine principle, and its use to power a toy, comes in second. Major innovations in manufacturing and were made at the Venetian Arsenal, but the spread of these innovations throughout Europe would wait until the start of the "Industrial Revolution". By the 16th century the Arsenal was the most powerful and efficient ships and munitions manufacturer in the world. It was capable of producing one fully equipped merchant or military vessel per day, whereas production of similar sized and featured ships elsewhere in Europe took months. Shipbuilding was slower and less efficient even in the seas-oriented states of England and Spain than in Venice. The Arsenal employed 16 000 people. The employees directly engaged in producing ships and the rope, oars, cloth, storage containers, weapons and other goods they required often lived close by, in the buildings around the shipyard. The records of Christendom's wars against the Turks are full of references to the power and influence of Venice, a state that at this time covered about a fiftieth the land area of France or Spain and a tiny fraction of the land area of the Ottoman Empire. Despite its geographical diminutiveness, Venice's naval power enabled it to control the strategic islands of Crete and Cyprus in Ottoman coastal waters. The naval power of Venice in this period was a result of factors additional to its effective shipbuilding. The Venetian government had all its merchant ships carry arms on board. It maintained a powerful reserve of about 100 warships in the Arsenal docks at all times. Its ships were manned by paid freemen of Venice, not slaves or mercenaries, and debtors could pay off their obligations by serving as rowers. Nevertheless, it was Venice's logistical and manufacturing muscle that floated and maintained its powerful navy. To ensure access to necessary raw materials Venice had seized and kept control over passes through the Alps to German lands in the North. Anticipating the Elizabethan principle whereby trade was an accessory of diplomacy and diplomacy an accessory of trade (the principle which was later named "mercantilism" by Adam Smith), the Venetian bureaucracy well understood that the city's success depended on its navy and army, and that the success of its navy and army depended on logistics. To this end, Venice devoted 10% of its public budget to the mighty Arsenal. At the Arsenal, shipbuilding parts were standardized, and each major component of this early bill of materials was produced by a specialized team of workers. The necessary parts were then assembled by another team, following which the ship would be moved to another part of the workbuildings for furnishing. 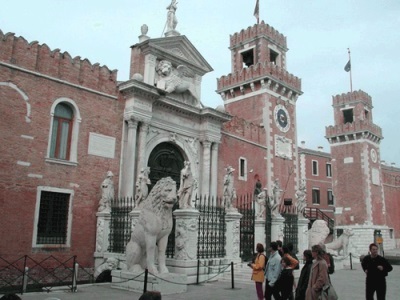 The managers of the Arsenal closely coordinated their policies and projects with officers of the Venice government. The buildings housing the Arsenal were continually expanded to ensure sufficient space for the ever-growing workforce. Eventually even technological research, experimentation, and weapon and ship design were being carried out at the Arsenal. Concentration of every necessary asset at one spot, division of labor, government-protected access to plentiful raw materials, and close coordination with the government bureaucracy were the keys to the power of the Arsenal. At the Arsenal, the modern concepts of standardized parts, assembly-line production, specialized work groups, and vertical integration were anticipated. That is why it is sometimes called the first factory in the world. The Words we Use - the words factory and manufacturing are related, both deriving from the Latin factor, meaning doer, maker. Manufacture means to make with the hands from factor and another Latin word, manus, meaning hands.